No matter how many guitars we own, we always need another one. Just ask my wife! Guitarists always need something new to fill that gnawing chasm of guitar lust. It’s unavoidable. But if you find yourself trying to decide between eating this month or spending all of your grocery money on that killer sounding ES-335 at the guitar store, then you better put down your wallet and read on. You might not have to buy anything new to get better tone out of your current guitar. Here’s how to eek some sweet tone out of your low-end (sub $300, made-in-somewhere-other-than-the-US) electric guitar and have some cash left over so no one has to go on a crash diet. Relatively cheap and ready to rock. Take a look at your strings. Do you see rust? Do the top, high pitch, (G, B, E) strings look a little discolored in spots. Do you remember the last time you changed them? Changing your strings is the easiest way to get better tone out of your guitar. Tired strings sound lifeless and dull. 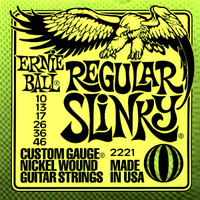 New strings can make your guitar sound bright and full. I love putting a fresh set of Ernie Ball’s on my electric because I can suddenly hear the full spectrum of sounds in each chord. This is a great $5 – $15 investment that will give your tone a boost. Skill level: Intermediate. Do it yourself or take it to your local guitar shop. Getting your guitar “set up” means a luthier or guitar tech will adjust the action, or distance between the strings and fretboard, so your guitar will sound better, feel better, and stay in tune. Fret buzz should also be minimized or eliminated. There’s nothing worse for a beginning guitarist struggling along with a guitar that has strings 4mm off the neck at the 12th fret, ain’t in tune past the 8th fret, and has a bad case of fret buzz. A good setup will also include setting the intonation, which makes sure your guitar will sound in tune up and down the neck. A guitar that is not properly intonated will sound ok at one end of the neck, but the same chords will sound a bit sour at another spot even after you’ve tuned it up. This sort of thing can be particularly frustrating for a beginner. So what does this have to do with guitar tone? Well, if your guitar plays well, you play better. And if you play better, you sound better. You’ll probably practice more, too. I’ve had times when one of my guitars was a dream to play, and the other had problems and was difficult to play–the strings were too high off the neck and it sounded sour in the first position. Guess which one I always played? A crappy playing guitar is a bus ticket to Quitsville. Pots and a switch. Bust out the soldering iron. If you have a custom $5000 Gibson Les Paul, hand crafted to your exact specs, then you can skip this step. But if you are a poor guitarist like me and you have a made-in-Mexico/Korea/Indonesia/China guitar that you like and plays well, but is lacking a little in the tone department, consider changing out the wiring and electronics. It doesn’t matter what style of guitar it is: Stratocaster, Telecaster, Les Paul, SG, whatever–swapping out the wiring and electronics can really give your axe a tone boost. I’m constantly amazed at how well the new low-end guitars play. But to keep costs down, manufacturers will typically skimp on the innards: tone pots, volume pots, capacitors, pickups are all usually poor quality. Simply swapping out the stock electronics with quality components can make a huge difference. Most people immediately think about changing pickups, but you might be surprised how much tone can be gained with quality electrical parts. You may even decide after adding new wiring that your stock pups are fine. If you’ve got a made-in-wherever guitar and you are on a budget, give guitarfetish.com a try. 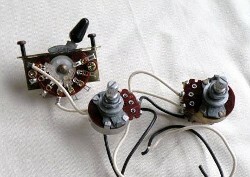 They’ve got custom wiring setups for most Strat, Tele and LP style guitars, among others. And are ready to help if you have any questions. Oh, and their wiring setups, tone pots, capacitors, pickups, etc. are usually inexpensive and get pretty good reviews from the guitar playing community. Oooooh. 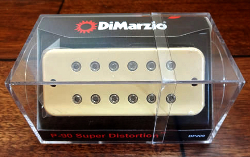 Dimarzio P-90s… Yeah, you want these. If you are handy with a soldering iron, changing out the pups on your electric is a sure way to up the tone quality on your electric. If your current bridge pup is thin and screechy but you need some crunch; or you want a nice warm, full, Jazzy sound out of your neck pickup, but ain’t getting it, swapping out the pickups is a nice upgrade. Some long-time guitarists will immediately swap out pups in a new made-in-Mexico/China/Indonesia, etc. guitar–they know what they want and don’t waste any time getting there. If your electric is a sub-$300 instrument, swapping out the pups should be a no-brainer. A nice set of Seymour Duncan Antiquity humbucker pickups in your made-in-Korea Les Paul copy should make a huge difference. If you’ve got a low-end Squier Strat or Tele, spending $50 to $100 on new pups is an excellent way to give your rig a tone upgrade. Once you get into the higher-end guitars that have quality pups from the factory, it boils down to what sound you want. If you ain’t quite satisfied with your current sound in your upper-end electric, testing pickups is an option. Talk to your local guitar store and do some research. Swapping out pickups is an involved process. So make it count. Do your research before taking the time to install a new set. And don’t toss or trade the old ones before installing the new ones. What if the new ones sound worse than the old ones? An obvious, but often forgotten idea in the mad tone chase, is that becoming a better guitarist through practice is a key ingredient to getting the best sound you can. A huge slice of the tone pie is in your hands and in your head. Let someone else play your guitar and the guitar will sound different. At a very core level, a good guitarist’s tone stays with him no matter what guitar he or she plays. The way your pick hits the strings, the way your fret hand presses down each string to create sounds, and a ton of other factors all add up to a distinct sound: your tone. It's all a matter of what sounds good to you. If the pups in right now seem to be lacking, then swapping them is an option. If you don't feel comfortable playing with the guts of the wiring harness then find a friend to help or take it to your local guitar shop. But don't the LSS humbuckers sound pretty good? I am a begginer but I can tell my blaster e6 encore sounds awful specially playing on high strings. I am tempted to buy a Yamaha Pacifica from Argos but dont want to waste what little i have chasing a sound like I hear the blues players play. I noticed they sound so different from my guitar so much that the song I have learnt to play sounds completely different. I know you said its down to the individual but even i can tell the sound just isn't the same at all. My strings I haven't changed but only had guitar a few months How often does strings needs changing? Should i invest in a Yamaha Pacifica from Argo or stick with Blaster E6 encore ? Hi David. I don't know anything about the Encore guitars but do know the Pacificas are great entry level guitars. If you are unsatisfied with your sound you might want to consider one very important factor: the amp. You can play a mediocre guitar through a $1000 amp and be blown away, and play a $1000 guitar through a $50 amp and sound like poop. You might want to try and play your current guitar through a nice amp and see how it sounds. Good luck and have fun in your guitar journey! Thanks for the tips. I just got a short scale fender tele and I'm going to take it to get set up this morning. However- you don't need to put "(or she)" in parentheses- I'm a woman and I've been playing for 10 years. Female guitarists are everywhere and every when- see them. Thanks! Hey Ingrid, thanks for the comments. Hope the set up helps your playing. Oh, I believe the Duncan JB's would sound oh so sweet indeed. Remember though, your amp also is a huge piece of the tone pie, which I probably should have mentioned in the post!! But you can slap on a mid-range guitar and plug into a big Marshall and I don't care what you play it's going to sound awesome. (Yeah, a bunch of dudes just puked, but I'm sticking to that.) I just know that when I plug my own little Squire Tele with its stock, mid-range bridge pup, into a big Marshall JCM xxxx, the sound, to my little ears, is sublime.